Our new farmhouse style front door that we found at a thrift store. Last year when we looked at this house you could barely open the front door. The key was impossible to turn and it would stick, the result of poor maintenance. The door is original and had obviously been painted..a lot. There were bare spots and chipping paint and it was just plain ugly. We started using the back door but my fall down the stairs 2 days after we closed, resulting in a broken foot, was enough to get the hubs to get the front door in working order. He worked his magic but the uglies couldn’t be overlooked. As soon as I was able to get around, I started looking at new front doors. It didn’t take long to realize that a new door wasn’t in the budget. 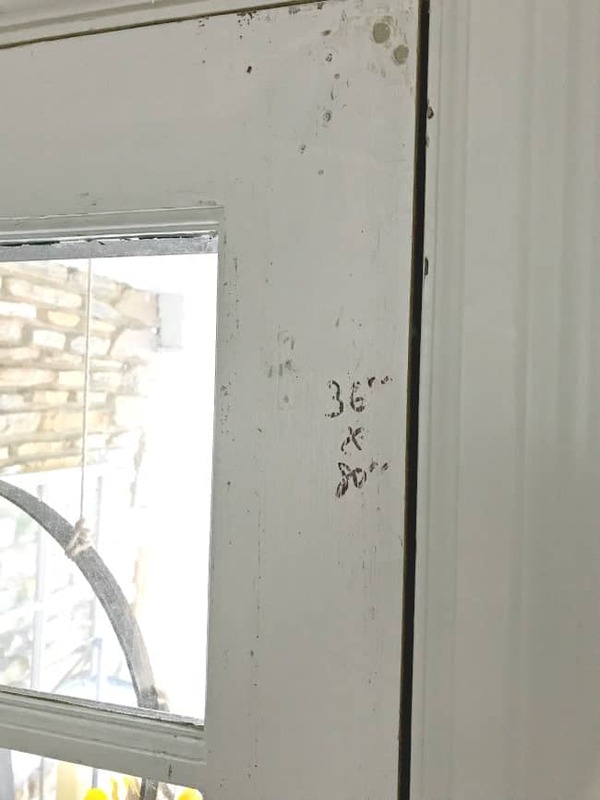 Nice wood doors are expensive, ya’ll!!! So the search for a new old door began. There’s plenty out there, at decent prices, but the size we needed is pretty popular. I probably searched every shop around for months and finally found “the one” at a local ReStore. It was a close enough match to the size we needed, and a steal at $15. Actually, we found 2 doors (the white one and the black one). I was going to use the white one for the front and the black one for the back but decided that the white one just didn’t fit the style of the house. 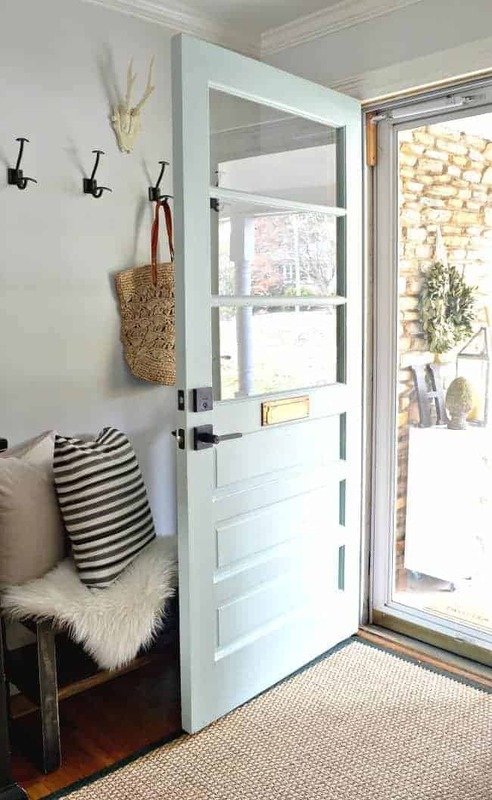 The green door loveliness is the storm door that will replace the old storm front door. I found that before we even moved into the cottage, and it was only $12. I can’t wait to get that baby up. Once we decided on a door, we took the old one down and cut the black door to size. We took a little bit off each side and were careful to leave space for a new lock and door knob. We also cut a hole for the mail slot. 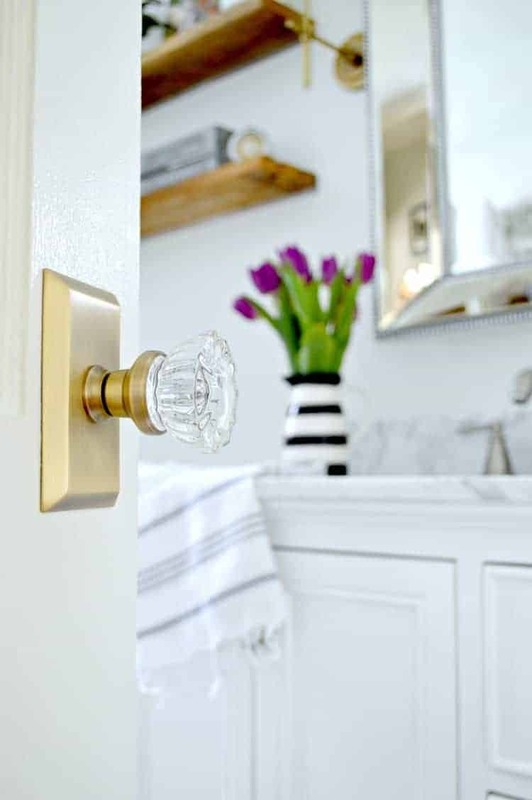 The old door hardware wasn’t salvageable but we were able to reuse the old brass mail slot. We had to fill a few holes and then gave it a good sanding and cleaning. The install was pretty easy but picking out a door knob and lock that actually fit was difficult. We bought 5 knobs and locks on our first trip but every time we tried a set, the lock would hit the door knob. Our third store, and the sixth or seventh try, we found a winner. It’s not what I originally wanted but it works and looks good. Paint color was the next step. If you’ve followed me for a while, you might remember our front door in our Illinois house. I loved that color and wanted something similar, but softer. It didn’t take me long to settle on Benjamin Moore Wythe Blue, Regal Select, Eggshell. Oh my…I love this color. It’s a pretty green/gray with a hint of blue. Yes, I am mixing the metal finishes but I’m ok with it. 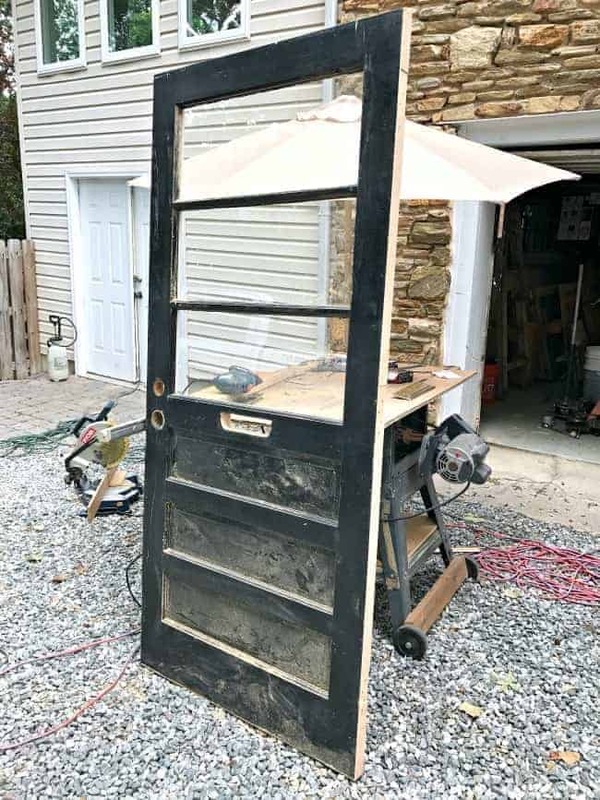 I really wanted to use what I could from the old door. I love the way it turned out, even if it wasn’t in the original plan. The light it let’s into this once dark space is awesome. Now I’m really itching to get the new, old storm door up. Oh, and replacing the back door is also on the long to-do list. You can also check out another update in the living room/entry, here. And how I updated an old door with new glass knobs, here. Oh wow! Sorry to hear you fell down the stairs and broke your foot. Glad to hear you got a beautiful new front door, at a really good price. Thanks so much Linda, I appreciate it! 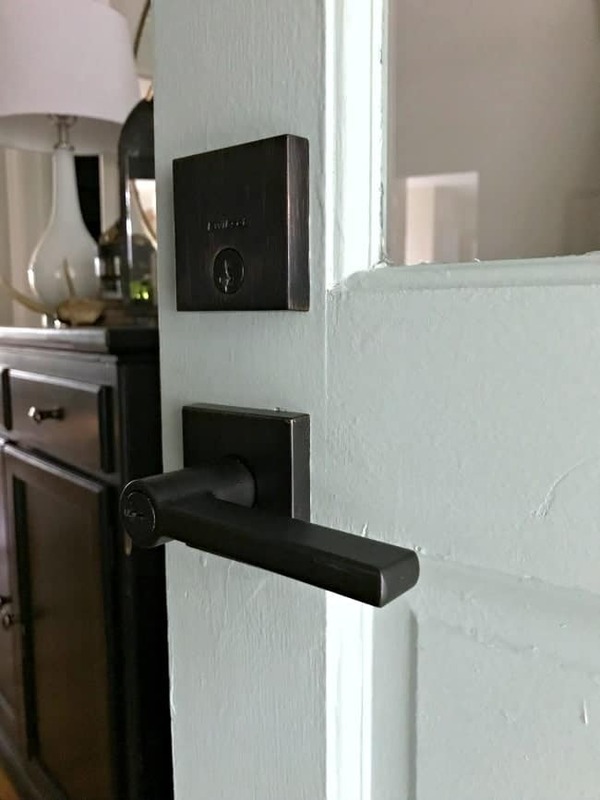 Why not take off the brass mail slot or tape around and spray flat black to match doorknob? Love love love it. Beautiful!!! Love the look, but security-wise is not very practical! Easy access for would-be burglar. So nice!! 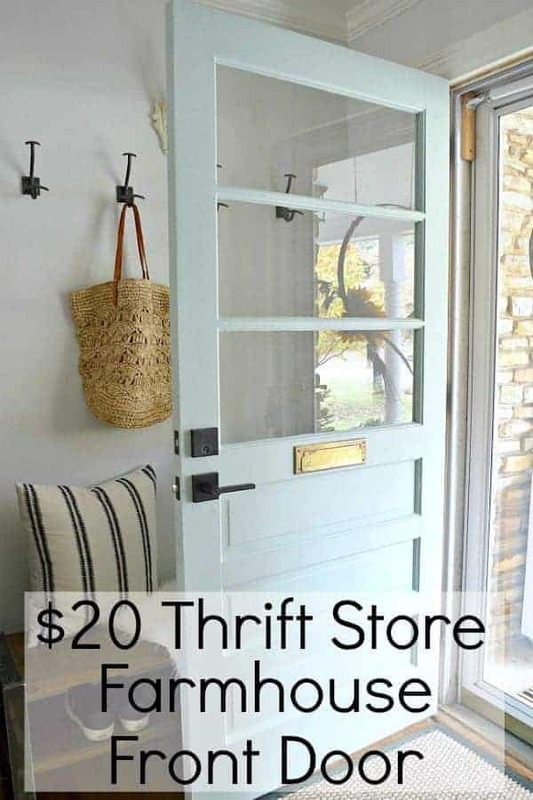 Your door is fabulous and what a steal! My eye also caught a glimpse of that fur on your chair! Wherever did you get that, if I can ask. Thanks so much, Sandra! I’m thrilled that we were able to find a solid wood door, with windows, in the right size, for only $20. The wait was definitely worth it. I think the door turned out great! 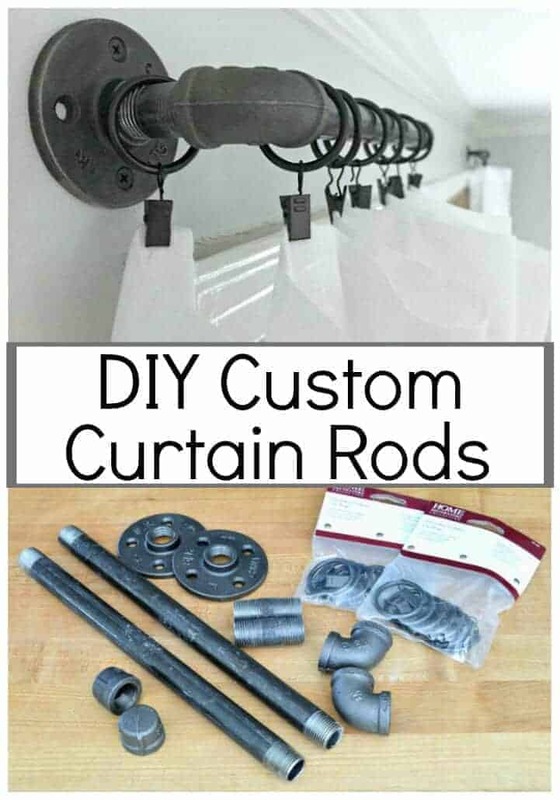 I especially like the hooks you have on the wall behind the door. I love your door, it looks great. I want another door, mines those old metal door with etched oval glass and i want a wood door. Now you really make me want one, lol! I wanted a new front door in our Illinois house too, and never got it, so I’m thrilled that we were able to get this one done. Thanks so much for stopping in Marlene! Kristi, This is an awesome door, wow, all the light it lets into your room, and the color you chose looks great!! I also really like that you incorporated the former doors mail slot into this new door. I love the charm the old mail slots bring to a front door. That is a great thing…we need creative projects in our lives. I think my hubby has become resigned…for many years he thought doing some things would mean we are done LOL. I doubt I will ever run out of projects. I am certain I will be on my deathbed imagining a new something to work on…or pushing my walker around the yard while we install something else. I think we both like to work 😉 P.S. 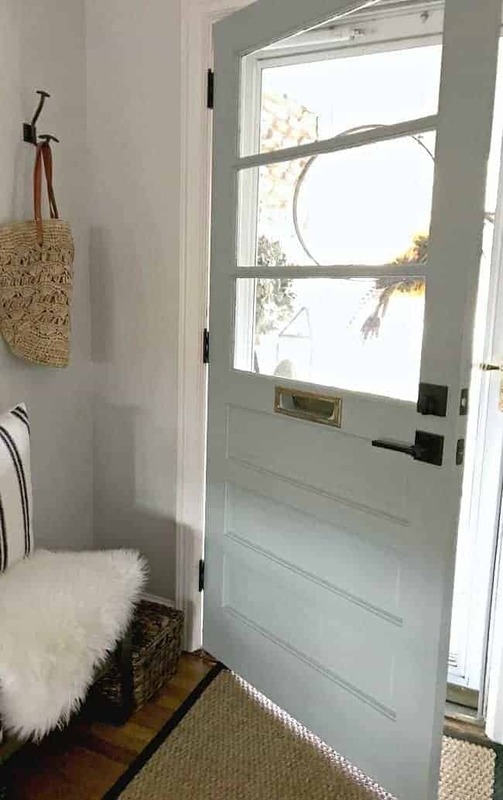 I love the sheepskin and pillows on the bench by the door. Wow, wow, wow! I love this door and the lockset. The windows on it are lovely, too. Great work rehabbing such a beautiful piece. I admire your do-it-yourself talent, Kristi & husband. Awww, thanks so much for the sweet comment Jill! 🙂 We love it too, and I’m so glad that we were able to turn a dusty old door into a beauty. I love your new door! And that color is so pretty! We moved into an older home about 4 months ago and the front door is not my fav! But the door leading to the side porch is perfect or will be after painting! 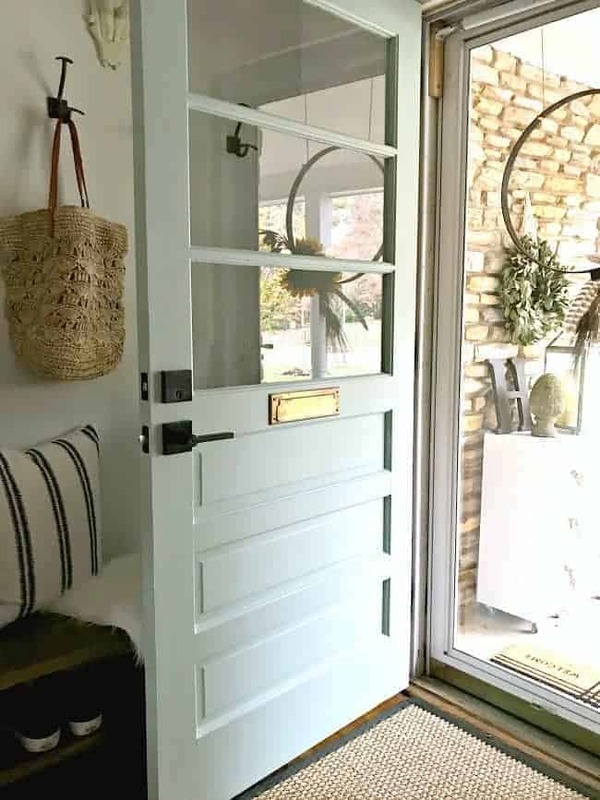 Love your new door and the paint color is amazing with the rest of your home, especially the inside decor. 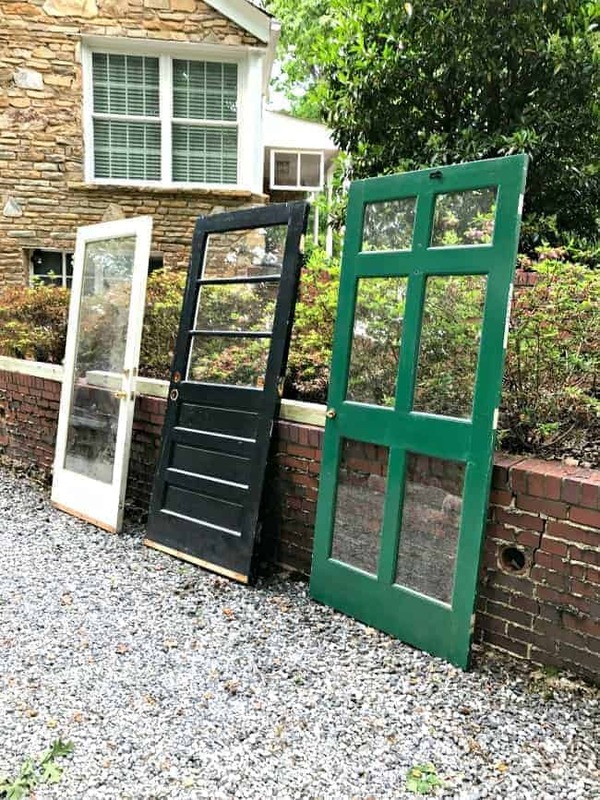 Also, the storm door you found is a great door, but won’t putting it in front of your new door cover the great architecture of the new door. 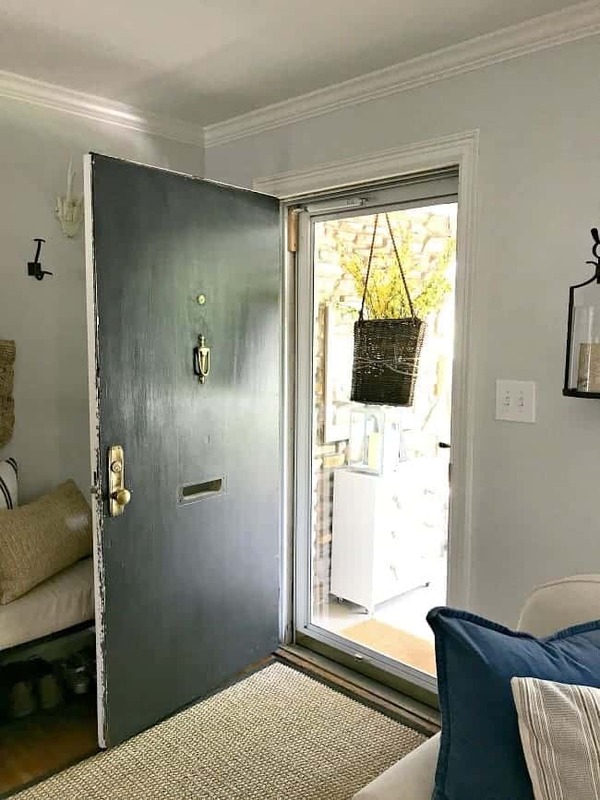 I know the full view storm door is a more modern touch than you probably want, but the new door is so nice I would hate to cover it up with another door that is so solid. Just one old woman’s opinion ….. Thanks so much Pat! We love the new door. We tried the storm door over each door (that’s why they were all out in a line). The new storm door will cover a little bit of the door but it has windows all over it so it should be ok. The hubs actually hated the full glass door. Besides the fact that it was too modern, he didn’t like all the glass. Way to much for him. I love your new front door. Don’t you love the glass and the way the light comes in? It’s perfect! Thanks, I love the color too. It’s not too bright but adds a little pop in this space. LOVE your new door! And it’s so much brighter! Thanks so much Ann! I love how bright it is with the new door. We have a huge oak tree in the front of the house that blocks a ton of light so the windows in the door are great for letting in the little bit of light we do get. Love the new door and the hardware. 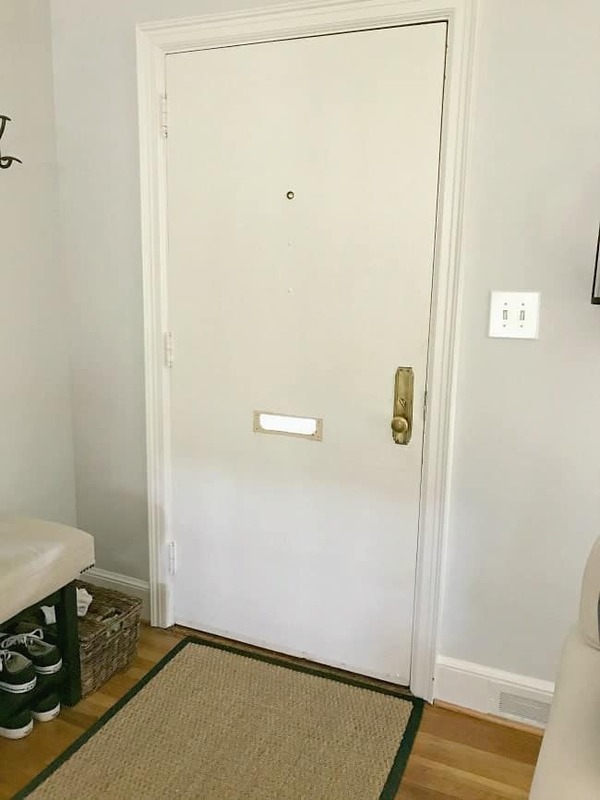 I had a new steel door installed about 10 years ago. Doesn’t seal right and my taste has changed but I’m forcing myself to live with it. So many other things that are more important. I absolutely love It. I want one too! Good job. Thanks Catherine! Such a huge change, right? Really pretty and worth the wait. Love your new door, what a difference, and is the colour of my house paint!